The McMinnville AVA lies due west of the town of McMinnville in the Coast Range Foothills of Yamhill County. This AVA is the most westerly of all Oregon AVAs and is geologically and climatically very different from any other in the Willamette Valley. An AVA or “American Viticultural Area” is defined as a delimited, grape-growing region distinguishable by unique geographical features and recognized by the Bureau of Alcohol and Tobacco as having unique characteristics. 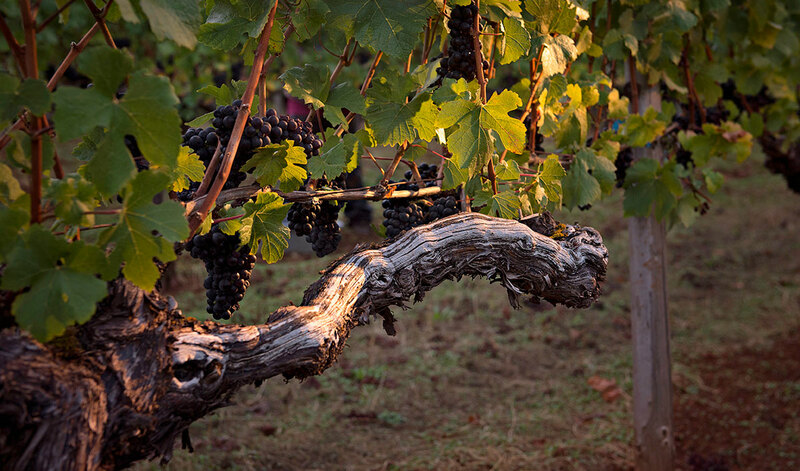 Geologically, the soils in the McMinnville AVA are the oldest and most complex of any Oregon AVA with a combination of marine sedimentary soils and basalt. The soils in our AVA were created during the Eocene period 38-55 million years ago and were the result of a combination of Cascade Mountain lava flows and tectonic plate movements that created the Coast Range Mountains. The plate movement exposed ancient and weathered soils in the foothill regions where our AVA is located and the lava flows created ‘basal lava fingers’ which can be seen amongst marine soils in the McMinnville AVA vineyards. The soils are primarily uplifted marine sedimentary loams and silts, with alluvial overlays. Beneath is a base of the uplifting basalt. Clay and silt loams average 20-40 inches in depth before reaching harder rock and compressed sediments, shot with basalt pebbles and stone. The uniqueness of the soils for winegrowing is in the 20 to 40 inch depth. Climatically, this AVA is again in a class of its own. These primarily east and south facing slopes facing sit in a protected weather shadow of the Coast-range Mountains. Rainfall is lower (33 inches annually) than sites only 12 to 20 miles to the east. The foothills also provide protection from chilling winds in the unstable air conditions of the spring and fall. Winegrowers also have the option of placing vineyards on more southerly facing sites to take advantage of the drying winds from the Van Duzer corridor, which helps control mold and mildew on the grapes during Oregon’s humid summer days. Of greatest note are the flavor qualities of the Pinot noirs from these soils, which are highly pigmented with a strong backbone of tannins and acidity and a massive palate of black fruit, spice, and earthy flavors. White wines from the Pinot family and other Northern European Cultivars, including Pinot Gris, Pinot Blanc and Riesling, have similar personalities, and are noted for their brightness, texture, and fruit forward profiles. There are currently over 600 acres of wine grapes planted within the AVA. Seven wineries currently produce wine within the AVA and over twenty other wineries make wine from fruit sources from our region.